WASHINGTON (CNN) -- It was the annual revving of the engines Sunday at the Lincoln Memorial as thousands of motorcyclists converged on Washington to honor those who have served the country. 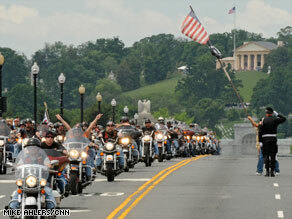 Members of Rolling Thunder ride into Washington on Sunday. Riders from Rolling Thunder, a group created to bring attention to soldiers listed as POW or MIA, rolled into the nation's capital, greeting crowds of supporters who lined the streets. "It's a great tribute to people that have sacrificed everything, including their life," said rider Mick Smith. He and fellow Vietnam veteran Juan Cruz rode their motorcycles from Pennsylvania. "It's a brotherhood that we have, veterans of the foreign wars," Cruz said. "The camaraderie is so perfect that we don't need anything else. We forget about our problems." Lyn Seidler was among the spectators who lined the motorcycle route in the hot and humid weather to greet the bikers as they passed over the Arlington Memorial Bridge into Washington. "The servicemen made a sacrifice," Seidler said. For her, cheering on Rolling Thunder was a way to help celebrate troops, "and to say thank you," she said. After completing their rides, the bikers gathered in front of the Lincoln Memorial. "I'm here today to honor our veterans, our fallen veterans, to help the living by supporting the dead," Cruz said. The Defense Department says there are more than 88,000 soldiers still listed as missing in action from World War II, the Korean War and the Vietnam War combined.